European scientists are going to try to measure the movement of the oceans by tracing their magnetism alone. The effort will be achieved using three super-sensitive spacecraft called Swarm, which should launch in 2012. The magnetic signal of the tides sweeping around the globe has been seen before, but the new mission would aim to observe far more detail. It should provide additional data on how the oceans transfer heat around the Earth, a key feature of the climate. "When salty ocean water flows through the magnetic field of the Earth, an electric field is generated and this electric field again makes a magnetic field," explained Dr Hermann Lühr, from the German Research Centre for Geosciences (GFZ) and a leading investigator on Swarm. "We hope to have the possibility to measure the ocean currents which are so important for climate dynamics, because oceans are transporting a lot of heat. The German Champ mission was the first to see at least the tidal signal, but with Swarm we want to be able to monitor the currents themselves." The new mission is one of the several innovative European Space Agency (Esa) endeavours being discussed this week here at the American Geophysical Union (AGU) Fall Meeting, the largest annual gathering of Earth and planetary scientists. 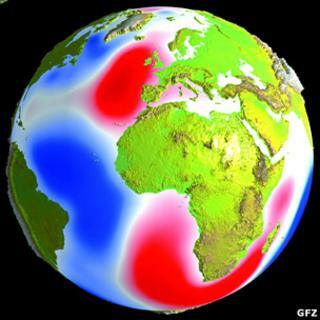 The major part of Earth's global magnetic field is generated by convection of molten iron within the planet's outer liquid core, but there are other components that contribute to the overall signal, including the magnetism retained in rocks. Swarm's goal is to investigate all the components, but pulling out the small part produced by ocean movement will probably be its greatest challenge, concedes Dr Mark Drinkwater from Esa's Earth observation division. "We're talking about tens of thousands of nanoteslas for the total field measured at satellite level, of which one part in 50,000 approximately is contributed by ocean circulation," he told BBC News. "So it's a akin to finding a needle in a haystack, but the modelling which has shown the retrievability of this element of the magnetic field has demonstrated that it might be possible with [our satellite system]." It means the spacecraft themselves have to be built with extreme care. The magnetism generated by the satellites' own workings has to be minimised as much as possible, and thoroughly modelled to understand what interference it might be introducing into the scientific data. Currently under construction with manufacturer EADS Astrium, the satellites look like giant mechanical rats with long tails. The tails are booms designed to hold Swarm's sensitive magnetometer instruments away from the "noise" that would inevitably come from the electronics inside the main body of the spacecraft. Every component put on the satellites has had to be tested, right down to the glues that have been used to bond some surfaces together. Any trace ferrous materials in the glues could ruin the measurements. "You can't go near the spacecraft with a standard spanner or screwdriver - all the tools you would normally use on a spacecraft build. You have to de-gauss them," said platform project manager Andy Jones. "You have to test them and make sure they're magnetically clean so they'll leave no trace, because if you touch a bolt with a magnetised spanner you will leave a field behind on that bolt." The Champ spacecraft came out of orbit just a few weeks ago, burning up in the Earth's atmosphere. Scientists reported first in 2003 that this satellite could sense the subtle magnetic field generated as the waters of the Earth moved under the gravitational tug of the Moon. This signal was apparent because of its very regular pattern. Sensing the more complex signal from general ocean currents will be much more difficult, however. At present, researchers use a range of methods to track the currents, including altimetry - the measurement of ocean surface height. "All these different forms of measurement give you a different answer," said Dr Lühr. "If you consider altimetry, this relies on seeing how the surface of the water is deformed by the current. But this can also be deformed by other effects like warming up, or having less salt in the water. "However, if you look into the magnetic field this is just the integral motion from top to bottom of the water, and it will give you a really independent answer about the net transport of that water." The Swarm satellites will be launched on a single rocket into a polar orbit some 300-500km (186-311 miles) above the Earth. Two of the satellites will circle the planet in tandem while the plane of the third spacecraft will be offset and gradually diverge over the course of the mission. This approach is expected to make it much easier for Swarm to separate out all the different components of the global magnetic field. Scientists say they still have much to learn about Earth's magnetism. The global field, which shields the planet from high-energy particles emanating from the Sun, appears to be getting weaker, particularly over the South Atlantic where Champ data was used to show there had been a 12% reduction during the course of three decades. It is in this so-called South Atlantic Anomaly that orbiting spacecraft experience most of their technical failures and where astronauts on the space station receive their largest dose of radiation.